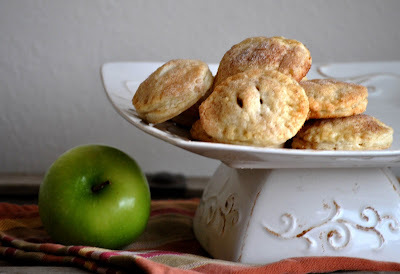 *Note--This can done with frozen, pre-made pie crust but I highly recommend using the homemade version. It tastes so much better! 1. To make the pie dough, combine the flour, sugar, and salt in a medium bowl and stir with a fork to blend. Using a pastry cutter, cut the butter into the flour mixture until the mixture is coarse and the largest pieces of butter are no bigger than small peas. Stir in the water and mix gently just until the dough has come together in a ball and all of the dry ingredients have been moistened. Form the dough into a disc and cover tightly with plastic wrap. Transfer to the refrigerator and chill for at least 1 hour. 2. When you are ready to make your cookies, preheat the oven to 350˚F. Line baking sheets with silicone baking mats or parchment paper (or spray with non-stick cooking spray). Peel, core, and cut apples into bite size pieces. Put the apples in a bowl and toss with the lemon juice. Add the sugar, cinnamon, and nutmeg, and stir until all the apples are completely coated. Set aside. 4. To assemble the cookies, transfer half of the chilled pie dough to a lightly floured work surface, keeping the other half in the refrigerator. Use a rolling pin to roll the dough out very thin, about 1/8 to 1/4-inch thick. Using a large round biscuit or cookie cutter (about 2 1/2 inches in diameter), cut out round pieces of the pie dough. Transfer half of the rounds to the prepared baking sheet. Brush the rounds lightly with water (this will help the pies seal). Add a teaspoon of apple filling to each round. 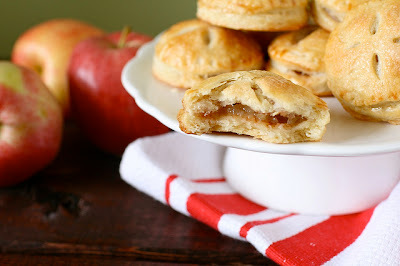 Layer a second round of dough on top of each apple slice and gently press the edges to help seal. Repeat this process with the remaining dough and apples. 5. 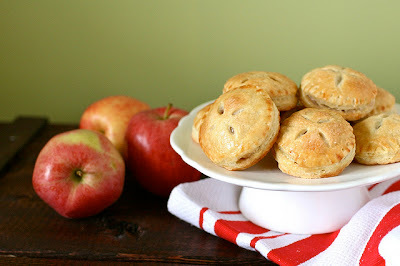 Crimp and seal the edges of the mini pies with the tines of a fork, dipping in flour if needed to prevent sticking. Lightly brush the tops of the cookies with the egg wash. Use a small paring knife to cut tiny slits in the top of each cookie. Sprinkle with additional sugar, if desired. Bake for 25-28 minutes or until light golden brown. Enjoy!